DURBAN, South Africa, July 8, 2010 (AFP) - Carles Puyol scored the only goal to ensure Spain coach Vicente Del Bosque's decision to drop Fernando Torres from the World Cup semi-final against Germany did not come back to haunt him. The European champions beat free-scoring Germany 1-0 to reach their first ever World Cup final, where twice runners-up Holland will be waiting for them at Johannesburg's Soccer City on Sunday. After all the pre-match talk about strikers, it was soaring centre-back Puyol who notched the only goal of a tight game in which Spain dominated and Germany paid for an overly cautious approach. Del Bosque left Torres on the bench after a disappointing tournament in which the Liverpool striker, still looking to regain his sharpness after a knee injury, has failed to score. Instead, the wily coach turned to Barcelona's Pedro to provide a youthful thrust on the flank while also freeing top scorer David Villa to play in his preferred central position. "It was a difficult decision," said Del Bosque. "Fernando is a boy everyone likes, a strong personality and a good player. But we took a decision on the basis of what we thought was best for this match." Pedro was lively and he teed up Villa on six minutes, but the pass was slightly too close to Germany goalkeeper Manuel Neuer and he closed down the new Barcelona forward to block his prod. On 13 minutes Puyol could have opened the scoring when he met Anders Iniesta's cross full on the head, but he got his trajectory wrong and the ball flew over the bar. Chances were few and far between with Xabi Alonso sending a pair of long range efforts wide and Pedro forcing Neuer to save. At the other end, Piotr Trochowski, in for the suspended Thomas Mueller, forced Iker Casillas into a save, Miroslav Klose volleyed over and Toni Kroos shot straight at the Spanish keeper. Spain were largely in control and yet their goal, 17 minutes from time, came from the most unlikely source. Xavi sent over a corner and Puyol arrived at pace to plant a bullet header past Neuer's despairing dive. They may already be champions of Europe and in their first World Cup final but Alonso said Spain will not be satisfied unless they land the major prize. "We want more, we've come a long way and now we're in the final. We want to celebrate something really big," he said. "There were a lot of nerves in the match and afterwards in the dressing room there was euphoria." Germany boss Joachim Loew admitted it was a game too far for his young team who had scored four goals against both England and Argentina in their previous two games. "We have to congratulate the Spanish team. They played very well and over the last two or three years they have been the most skilled team of all," he said. "They showed that with the way they passed the ball very quickly and we were not able to reproduce the kind of play we did in previous matches. "I think we were a little inhibited. But it was very difficult. When we won the ball we were losing it very quickly. "They won the European Championship (in 2008) in a very convincing way. They have won all their important games for the last two or three years and they are a pretty much unchanged group of players. "It is as if they are playing on auto-pilot now and I'm fairly confident they are going to go on and win the title. "They can be very dominant and hard to control. They are just a wonderful team. They are masters of the game and you can see it in every pass." While Loew may be tipping Spain, Del Bosque is not getting carried away. "We will not be blinded by success. We will enjoy this and (Thursday) we start preparing for the final," he said. "There is nothing more difficult or precious than to win a World Cup. But we still have to play the final. We cannot start bragging or get too conceited yet." 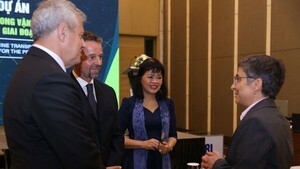 The National Institute of Vaccines and Medical Biologicals (NICVB), the National Institute of Hygiene and Epidemiology (NIHE) and Zuellig Pharma have officially announced a project to expand access to vaccines in Vietnam through the use of the eZCooler – an innovative packaging technology that ensures the integrity of temperature sensitive products to the last mile of transportation.